Our classic “Bnei Ohr” tallit bag and tallit is made of 100% light and non-abrasive wool embellished with 13 stripes in different shades of blue till purple. The fabric is a bright off-white color, medium-weight and comfortable enough to use every day. Each Tallit comes with kosher white tzitzit tied to the four corners. A matching Kipa is also available, as well as “Techelet” blue dyed Tzitzit. See below for options. 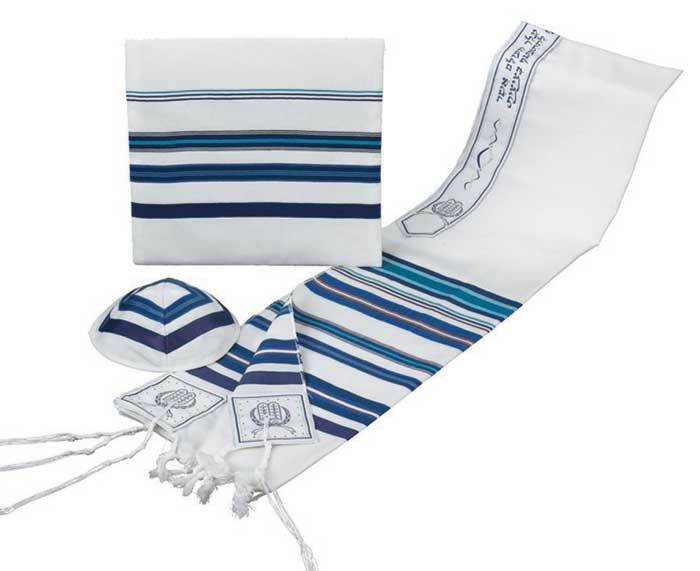 Note: We only offer the more expensive Techelet, which will not stain your Tallit. Personalization is available at checkout. Tallit is available in multiple sizes. Price shown reflects 18" x 72". Click item image for more details.